One of the main attractions at Brazilian Day is the main stage where major Brazilian artists perform for the throngs of green, yellow and blue clad fans. This year it's Sertanejo super duo Jorge & Mateus and dance/pop star Latino. If you like large crowds and live concerts I recommend you go, even if you don't know Portuguese or know these artists. 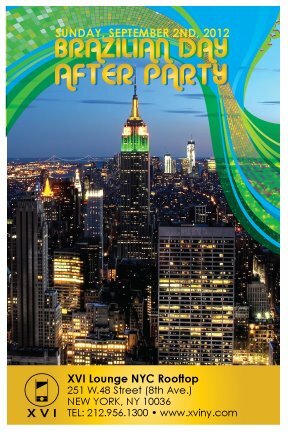 The energy is sure to be electric and unlike anything you've experienced! Jorge e Mateus is one of the most popular groups making Música Sertaneja, Brazilian country music. Sertaneja is the genre most played on Brazilian radio. Jorge e Mateus have released 2 gold and 2 platinum albums since 2007 on the Universal Music label. They sing a lot about romantic love and heartbreak. As you can see from the video they draw crowds of tens of thousands and are well-loved in Brazil. "Pode Chorar" (2009, Universal Music Ltda), Portuguese for "you can cry" is one of their major hits, about the end of a love affair. They sing that it's now the other's turn to cry since he's cried over her already. Apparently Jorge and Mateus also have a social conscience; they recently donated the entire proceeds of a sold-out concert, over US$183,000, to a cancer hospital ("Jorge e Mateus batem o recorde do ano e doam cachê em Barretos", August 26, 2012, PBAgora.com.br). You've probably heard at least one version of "Dança Kuduro". This one by Latino featuring Daddy Kall is a version of French-Portuguese singer/songwriter/producer Lucenzo's 2010 dance hit "Vem Dançar Kuduro", which became popular in many European countries. There are several versions of the song including one with Lucenzo and Puerto Rican reggaeton singer Don Omar, and artist Pitbull. Kuduro is a music and dance style from Angola. Latino's "Dança Kuduro" was released earlier this year on Universal Music. Latino's music career has spanned 2 decades and included the release of 9 commercially successful albums, hosting Brazil's Sábado Show and producing for other recording artists. 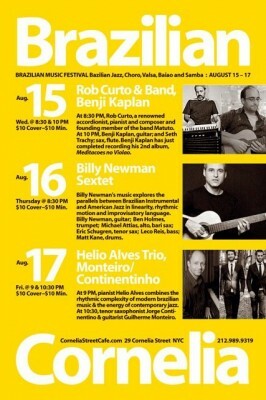 "Cornelia Street Cafe presents Brazilian Music Fest, featuring Brazilian Jazz, Choro, Valsa, Baiao & Samba sounds from Aug 15th to 17th. The festival kicks off with a performance on the 15th by Rob Curto, renowned accordionist, pianist and composer and a founding member of the band Matuto which was chosen to represent the US State Department overseas as part of the American Music Abroad program in 2012. Several people have asked me about blackness and race in Brazil. I thought you would find this interesting. Below is a description of the documentary Ebony Goddess: Queen of Ilê Aiyê, clip above. "Ebony Goddess: Queen of Ilê Aiyê follows three women competing to be the carnival queen of Ilê Aiyê, a prominent and controversial Afro-Brazilian group with an all-black membership. The selection is based on Afro-centric notions of beauty, in counterpoint to prevailing standards of beauty in Brazil, a country famous for slim supermodels and plastic surgery. Contestants for the title of Ebony Goddess dress in flowing African-style garments, gracefully performing traditional Afro-Brazilian dances to songs praising the beauty of black women. For Aurelina, Joseane and Talita, the competition for the title of Ebony Goddess is part of a profound and personal search for identity and self-esteem. The figure of the Ebony Goddess, representing a “black is beautiful” view of black women, resonates with women of African descent in Brazil, the United States and throughout the world of the African Diaspora...Following the three candidates’ daily lives, dance rehearsals, and interactions with each other, Ebony Goddess: Queen of Ilê Aiyê shows the contest’s role in reshaping the idea of beauty in a society in which African descendants constitute the majority of the population but is pervaded by Euro-centric concepts of body esthetics. The concept of the Ebony Goddess creates an alternative view of the black female body as beautiful, desirable, and talented, promoting social change at its most basic level: the individual sense of self." 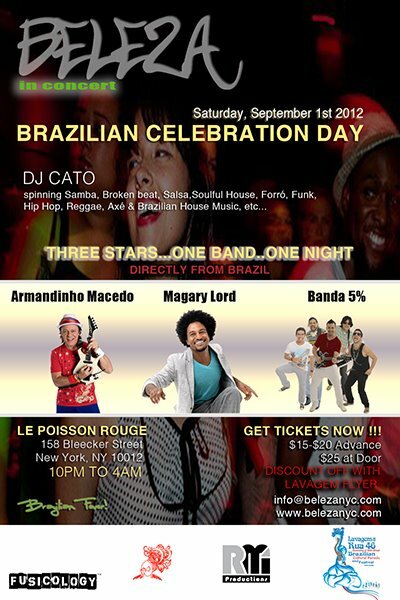 September 1st – Lavagem da Rua 46 - Brazilian Cultural Parade and Festival. Day-long music, dance, parade & festival. Free shows, arts & crafts, exotic food, samba capoeira & cultural performance. 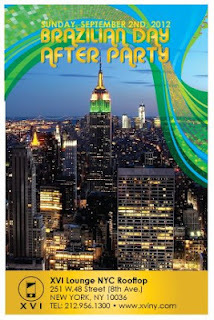 Where: "Little Brazil", 46th Street and 6th Ave, Manhattan NYC. 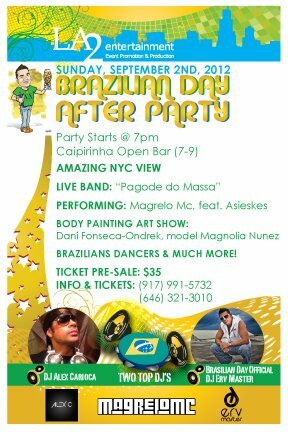 September 2st – Brazilian Day 2012 - 25-block street fair and live performances by major Brazilian recording artists.